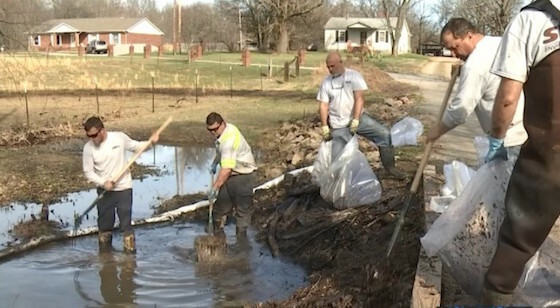 Workers start the clean up process after a pump failure combined with flooding and rain caused an oil spill in McCracken County, KY.
A pump failure combined with flooding and rain are to blame for an oil spill in McCracken County, KY, said P&L Railway officials in charge of storing the oil. P&L has hired SWS Environmental Services to clean up a creek and a front yard on Poole Road where the oil spill occurred. Heavy rain overloaded an oil container at its locomotive repair shop, company officials said. That, on top of a pump failure, caused the spill. A large amount of oil spilled onto the ground and into the tributary of Island Creek, said a spokesperson with the Kentucky Energy and Environment Cabinet. The company said the spillover happened early last Friday. SWS crews were out cleaning the site Tuesday. They were scooping debris, and putting it in bags and onto the backs of trucks. They also deployed booms, aimed at containing the oil, into the ditches along Poole Road. McCracken County Emergency Management Director Jerome Mansfield had not been briefed on the spill as late as Tuesday night. “Paducah & Louisville Railway, Inc. has been responding to an oil release which occurred during the early morning hours of February 23, 2018. A large amount of rain and flooding inundated the oil containment system at P&L’s locomotive repair shop. This system collects and contains potential leaks from locomotives and spills from fueling or cleaning. A mechanical failure of the water pumping system compounded the issue. This large amount of water overloaded the system and resulted in a release which affected a small creek and property in the Poole Road area. Cleanup activities are still ongoing. Due to the low-lying area and saturation of the ground, manual cleanup methods are being utilized to address any damage to the creek and adjacent properties.